Top secret documents about the D-Day landings have been found under the floorboards of a New Forest hotel. 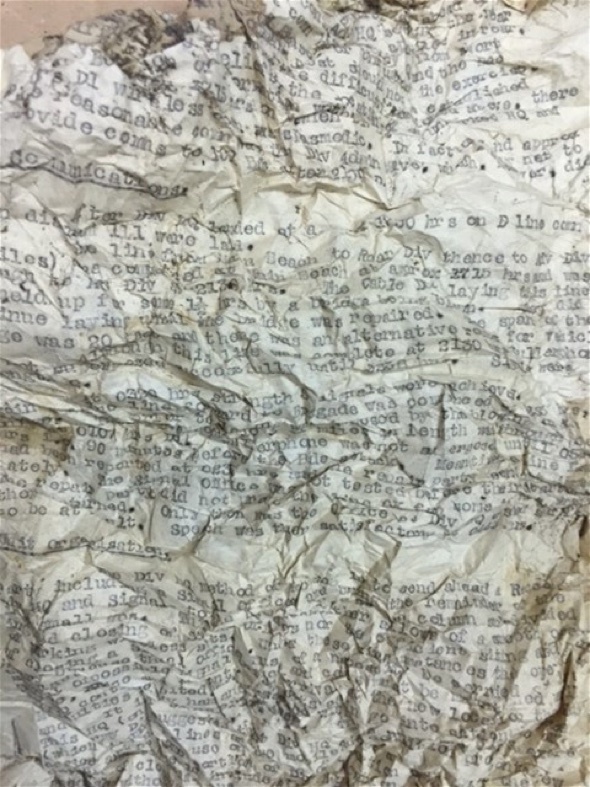 Staff at the Balmer Lawn Hotel found the crumpled set of orders for the Normandy invasion more than 70 years after the establishment was used as an army staff college. The hotel's website says: "As part of the current refurbishment, we have been replacing some floorboards on the 1st floor and we have found some letters from 1944. "In the Second World War, the hotel was transformed into an Army Staff College and some of the "Orders for the Day" were issued from the hotel for the D-Day invasion. 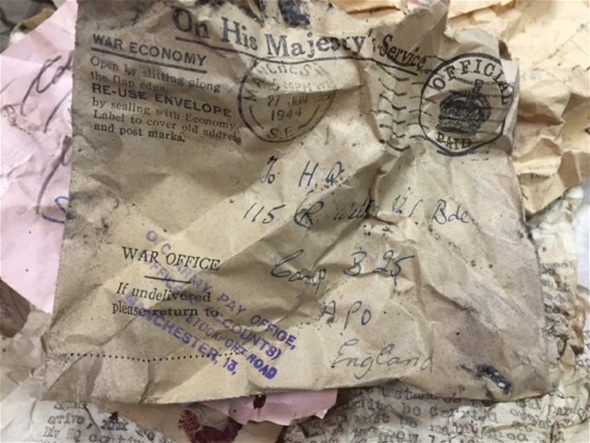 "We were so excited to read through the letters that we found, which is all 'on His Majesty's Service'. Many of the documents mentioned for the contents to be kept 'secret'." One of the notes even detailed the problems associated with rigging up a 10-mile phone cable for advancing troops on 'D-Day 1' - 7 June 1944, the day after D-Day. According to the Daily Mail, the hotel's owner Chris Wilson said: "We've found spent ammunition under floorboards before, but never this quantity of documents. It ties the hotel to its history. "They are quite detailed and specific orders to be followed by troops on the ground. "They're in a delicate condition and unscrunching them will have to be done very carefully. After that I imagine we'll put them on display." The Daily Telegraph reports a hotel spokesman added: "We are still in the process of evaluating the papers but some seem to include code on while others are more to do with the day-to-day organisation of the soldiers. One includes an invite to all personnel to attend a musical variety show. "Perhaps of most interest are the documents that refer to the D-Day landings. "One document refers to D-Day1 - June 7 1944 - and mentions difficulties in setting up a ten-mile telephone cable as troops continued advancing into northern France." The Place consists of five luxury boutique villas, all with private infinity pools, that offer you total privacy and complete relaxation. The luxury resort nestles charmingly in the hills above Sairee, close enough to be convenient for restaurants, bars, shops and the longest beach on the island of Ko Tao, but far enough away to savour the tranquillity and refreshing breeze that comes with being in the hills. The villas feature stunning sea views. Riad Noir d'Ivoire is a romantic destination in Marrakech composed of five suites, three of which have private roof terraces and Jacuzzis, two junior suites and two double rooms. Services include Spa with traditional hammam, Boutique, fully equipped gym, library, restaurant and a heated pool. All suites have fireplaces and all rooms, have air conditioning, heating, mini-bars, hairdryers, wall safes and flat screen televisions. Meet and greet service with our donkey Couscous and our four loving cats! 2inn1 Kensington is flanked by the imposing slopes of Table Mountain and Lion's Head in Cape Town. It combines an authentically, stylishly remodelled Victorian house and a modern designed bungalow set in a beautiful tranquil garden. The pool area has sunbathed terraces offering magnificent views. The nine luxury rooms are equipped with every possible comfort. The Old Rectory Hotel is a very special place. A wonderful mix of a stylish boutique country house coupled with an unstuffy relaxed atmosphere. Nestled on the stunning Exmoor coast in North Devon, The Old Rectory Hotel is a haven in which to unwind - no crowds, no traffic; just birdsong and jaw dropping scenery. This is somewhere magical to stop and smell the roses - so if you need to soothe the mind and replenish the soul, you couldn't choose a better place. At The Old Rectory Hotel you'll find the simple things done well; a warm welcome, thoughtful service, fabulous luxury rooms, fantastic local food from Exmoor and North Devon and, of course, an award winning wine list. If you were running away, this is where you would go! Akademie Street Boutique Hotel and Guest House in Franschhoek offers luxury five star accommodations in six unique buildings all situated on the same beautiful property in a quiet area of the village in the heart of the Cape wine lands. There are four swimming pools and four gardens. This hotel and guest house is in a quiet area within easy walking distance to the restaurants. Each of oursix guesthouses at Akademie is unique. Three have their own private garden and swimming pool, the other three share a large solar heated pool. Located on the shores of Lake Atitlán under the San Pedro, Atitlán, and Toliman volcanoes, La Fortuna at Atitlan is tucked into the private bay of Patzisotz, only a 5 minute boat ride from Panajachel. Here you can relax in our lush jungle and gardens, and take in the view of Central America’s most spectacular lake. Hiking, kayaking, scuba diving, and exploring the indigenous villages around the lake can be organized through the resort. Come and experience the natural and cultural wonder of Lago Atitlan at La Fortuna. Suites all have stunning private garden bathrooms with huge hot tubs, as well as a cozy loft with day bed and breathtaking views of the lake. Standard bungalows have a private garden bathroom with rain shower, and queen and single beds. We have a fire heated hot tub on the front of the property and a swim up floating dock. There is free wifi on the property, as well. We can help you arrange transportation from the airport or from/to other destinations in Guatemala, Mexico, Honduras and Belize. Please note this location is NOT ideal for those individuals who have mobility issues or for small children. Anastasis Apartments comprise of ten apartments and suites, one secluded exclusive villa and have been individually decorated with taste and finesse offering discreet luxury for a pleasant stay. All have undisturbed views of the Aegean Sea and the sunset. The Dairy Private Luxury hotel, Queenstown is your perfect escape. Our 13-room boutique hotel is in the centre of Queenstown and yet private and quiet. Not just a Bed and Breakfast, the property is renowned for its excellent service from the minute that you walk through the door. We are able to assist with everything during your stay. We are happy to arrange forward travel, look after your luggage as you venture to Milford Sound or walk The Routeburn. Let us assist you with dinner reservations and some of the many activities that Queenstown has to offer. La Minerva is an exclusive 18 room hotel, in which each and every customer is made to feel, first and foremost, a welcome guest, to the hotel and to the Island of Capri. The hotel has been recently renovated, with original interior design, stylishly combining modern features with typical elements of island architecture, including characteristic floors in hand-painted majolica, artisan-crafted ceramics, vaulted ceilings, and sweeping arches. The Hotel is situated in the center of Capri, looking out towards the sea, in a peaceful pedestrian area just steps away from the island’s fashionable shopping district, Via Camerelle. The hotel features a pool, bar/lounge, minibar, room service & free breakfast. The Clarence is Portsmouth and Southsea's multi award-winning adults only luxury boutique hotel. This Edwardian residence has been stylishly converted to offer well designed and individually styled rooms with luxury bathrooms. Guests can enjoy a complimentary drink on arrival, mid-day check out and 24 Hour room service. All rooms offer Air-conditioning, King-sized bed, complimentary Wi-Fi and Movies on demand. Perfectly situated just 5 mins away from all major attractions and just a few hundred yards from the seafront, The Clarence is the ideal place to stay whether it be for Business or that well earned break. The Clarence also offers guests in-room health and beauty treatments. "We recently spent out 30th wedding anniversary at the Old rectory and this was our 5th visit. We stayed in the new suite, The Arlington, which is absolutely fabulous, beautifully furnished and comfortable. Waiting in the room were champagne truffles and an anniversary card to mark our special occasion - very thoughtful." "What a fantastic find this was. Carole and Andy are first class hosts. Every detail was thought of and the breakfasts were excellent. The bedrooms were well designed and comfortable and we will definitely be going there again." "Beautiful room, delicious breakfasts, spotlessly clean, wonderful sea views,very pleasant & knowledgeable hosts and a truly wonderful location! When planning a visit to North Devon & Exmoor this hotel is too good to miss out on. Highly recommended." "Sumptuously decorated, rooms spotlessly clean, huge bed, fantastic sea view, wonderful historic building in a great seafront setting. Staff couldn't have been more helpful even printing our boarding passes for the journey home. Generous and delicious part buffet breakfast (cooked breakfast waitress served). Great place for a peaceful and relaxing break." "If you love good food, wonderful views, tranquility, waking up to a stream and meadow in front of your window, a cup of tea/coffee and a newspaper (all complimentary) in bed each morning This is for you. I return each year as its just what I need to relax and get away from a stressful busy work life." "My Fiancé booked this for a romantic weekend away. It was fantastic. We stayed in the suite with a jacuzzi outside and amazing fire. This place was sophisticated, romantic, chic everything I love. Great location and fab restaurants very close." "Had a wonderful stay, staff were all so kind and nothing was too much trouble. Great sea view over Carbis Bay, the food was amazing from afternoon tea to cooked breakfast!! All rooms were so well presented, cannot wait to go back." "What a little gem! Everything about this hotel is just superb, from its peaceful secluded location to the warm, sincere hospitality and the fine dining experience. Our room was a garden room, which was spacious, well furnished and spotlessly clean. " "My wife and I had the privilege to visit Rampsbeck the first two days in January, the staff very friendly, the food was excellent. This is a gorgeous country house beautiful open fires and peaceful setting, very clean, just what you need to recharge your batteries for the new year, it is surrounded by some of the most beautiful country side, we have all ready booked for next year. A must visit well worth every penny. " "Excellent service, very comfortable and nicely decorated room. Food was truly outstanding with nearly everything sourced locally. Would definitely recommend to anyone wanting a luxury break in south lakes."